L.A. 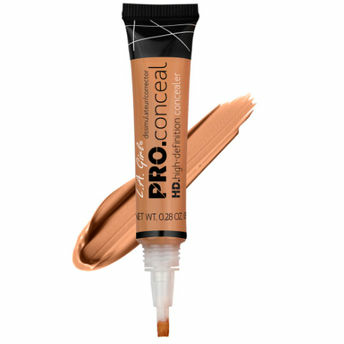 Girl's HD Pro Concealers are crease-resistant with opaque coverage featuring creamy, yet lightweight texture. The long-wearing concealer formula camouflages darkness under the eyes, redness and skin imperfections. L.A concealers provide complete, natural-looking coverage, even skin tones, cover dark circles and minimize fine lines around the eyes. About the Brand: L.A. GIRL Cosmetics is a renowned US based brand that focuses on meeting the beauty needs of every woman. They have a wide range of on-trend, Innovative and high-quality products for makeup enthusiasts all across the world. With an amazing selection of high-quality color cosmetics for all makeup users - from the savvy beauty junkies to inspired novices, that cater to makeup enthusiasts all over the world. L.A. Girl has become a destination brand that offers beauty without compromise – Beauty for all! Explore the entire range of Concealer available on Nykaa. Shop more L.A. Girl products here.You can browse through the complete world of L.A. Girl Concealer .Alternatively, you can also find many more products from the L.A. Girl Pro Conceal HD range.